Israeli media reported, Tuesday, that Khader Adnan, the Palestinian administrative detainee who has been on hunger strike for over a month has been forcibly hospitalized and chained to his bed.Al Ray reports that Khader Adnan is hospitalized in Assaf Haroteh, with one hand and one leg cuffed to the bed 24-hours a day and three policemen in his room around the clock, said two Israeli anti-occupation activists who visited him last Friday. Adnan, who was placed under administrative detention for the ninth time 11 months ago, went on hunger strike to protest his prolonged detention without trial. 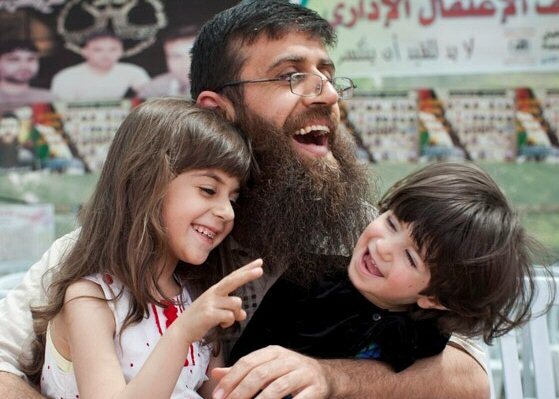 Three years ago, during another period of administrative detention, he won his release after hunger-striking for 66 days. Altogether he has spent more than six years in Israeli detention. Adnan , who is refusing to undergo medical tests, objected to his hospitalization because he knew he would be chained to the bed, attorney Jawad Boulus said. According to Israeli sources, Israeli Prison Service (IPS) regulations forbid cuffing a prisoner unless the warden fears ‘he is liable to escape or help other to escape, cause damage to people or property, damage or destroy evidence, or receive or deliver an abject liable to be used to commit a crime or undermine discipline in his place of custody.’ IPS spokeswoman Siva Weizman declined to specify which of these offensives the service feared Adnan would commit. Ahmed Sa’adat, secretary general of the Popular Front for the Liberation of Palestine said that the 2012 hunger strike was called to protest the prevention of family visits, prolonged periods of isolation and the widespread use of administrative detention. But, neither written nor oral agreements reached at the time are being kept, according to Sa’adat.